SEW THANKFUL FOR YOU SALE! My way of showing you how thankful will be on November 18th. Everyone coming in the door will receive 30% off any single one item or yardage (including a whole bolt) – exception - furniture and machines (feet are included!). This does not include sale items though you can take the incremental % off. This includes anything you may have been wanting that I don’t have and can special order for you! You have been so wonderful and patient trying to help me get started. I’ve had a lot of help, so enjoy the rewards! Firmware Alert: Bernina has issued a firmware MUST UPDATE alert for 790 and 880 users. This update is available on your My Bernina site. If you do not know how to do the update, please call and we will schedule a time for you to bring it in and we will assist you with getting your firmware up-to-date. The November Free CD's are here for the OESD FALL BUNDLE SALE!!!! This is a wonderful deal for all embroiderers. ANY OESD sell totaling $79 or more (monthly for Nov & Dec) gets you a free CD of holiday patters/motifs. There are 3 different ones and they are sooo cute! We have catalogs available and if we don't have what you want in stock, we will let you pre-pay and we will order it and count it toward your sale. Need that Christmas Village collection piece? The Diner is the new 2017 addition, and now is the time to get it! ALL CHRISTMAS, FALL AND HALLOWEEN FABRICS ARE MARKED 20% OFF for the remainder of the year. The Bundle It Up sale was so popular we will continue it through December on the fat quarters and the QS rulers. FQ bundles are purchase 8 and get them for $25 and you select the FQ’s you want that are pre-cut. (You even get the 20% off the bundle price for the holiday fabrics!) On the QS rulers everyone is raving about, we are giving a 20% discount if you purchase any 3 or more at a time on the 3rd and additional rulers – so stock up! We will order any sizes you don’t have! B790+ or B880+ machines get a new Koala cabinet or a Bernina 700 machine Free! There alternates to that - get the newest embroidery software free or a new B350 PE! These are unpublished alternative offers I can give. If that doesn't suit your fancy, we'll go back to the protective travel cases and the accessory and embroidery kit worth $2,500! WE WANT TO MOVE THOSE MACHINES! I will let you know that I got the holiday scoop in the webinar....(Hint – there are 48 month and 60 month financing periods between now and Christmas. There is also a 50% off MSRP price on suitcases as well as another 25% off on all feet sale!) Whoo Hoo! Stay tuned to my Facebook and web page for the dates. There is no “foot of the month” showing for November! Laurel Burch Mythical Jungle with all the accenting fabrics came in. A new flannel line is being launched to go with these and they should be in before year end – Dec ship dates were given. Flannels Are Here! These are the softest, nicest flannels ever! Several have purchased them for PJ bottoms and quilt backing for baby quilts! What fun. There were pictures on Facebook. Lord of the Rings digital prints with two accenting panels are here. I’m not going to lie to you folks…they are expensive but exquisite. We have both panels made up into throws and what gorgeous pieces they are. You might use that 30% Thank You Discount on the LOTR fabric! The newest Stonehenge Gradation collections in blacks came in. They move from very dark black on black to gray on gray. I also have the white on white Gradations coming along with two 108” wide-back bolts from the Gradations collection on the way. Speaking of wide-backs. We now have all the Moda white muslins in stock for a bit cheaper solution. The 45”, 90”, 108” and the 120” are in the shop. Moda Crackle and Grunge came in. We also got in a complete suite of batting sizes. Koala Floor Models: I’m selling all my Koala floor models. I’ll still get them if you need them, but I’m re-vamping my Bernina sales area so I can bring more machines to the floor and I need that space. Bernette Machines In Stock: We have 8 Bernette machines in house if you are looking for a cheaper price point and a better machine than the Wal-Mart brands for holiday gifts, getting a granddaughter started, etc. I have three Sew & Go’s and I know that they will be on sale for $129 during the holiday specials. We have over 700 bolts coming between now and June! The Embroidery Shop is up and running and we have completed our first orders! We are stitching some gorgeous items to sell. If you need that Christmas monogramming done – drop it on by! 11/18 – POT LUCK OPEN SEW DAY!! BRING ANY PROJECT AND SPEND THE DAY! 12/2 – Mastery Class (Be sure to sign up!) Wookbook 3 covering more feet and decorative stitches. Next month we break out the Embroidery Modules! 12/5 – Judy Niemeyer sew day with Judy Bowers (Must sign up!) We will cancel if less than 3 are coming. 12/11 – POT LUCK OPEN SEW DAY!! BRING ANY PROJECT AND SPEND THE DAY! 12/24 – 01/01/2019 Shop closed for the holidays and inventory. Even if we are here working we cannot make sales. Mastery classes are now available the first Saturday of every month. 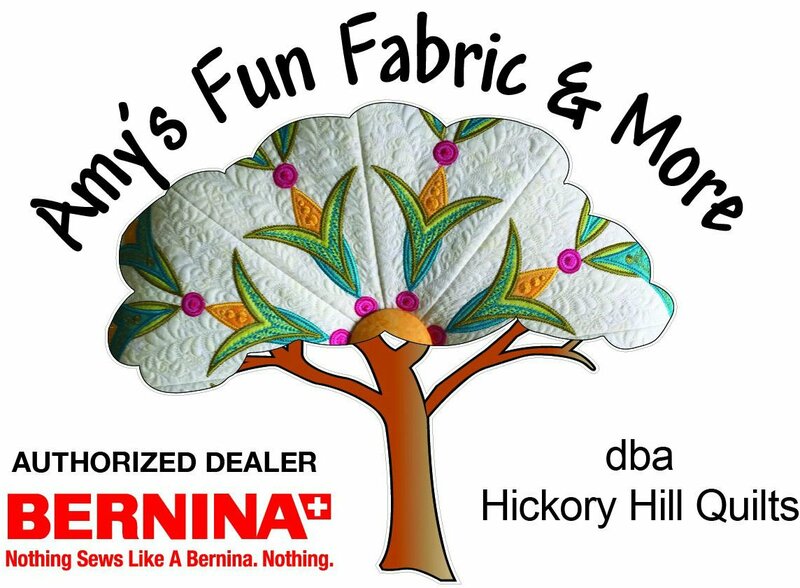 The classes are available to all Bernina owners. 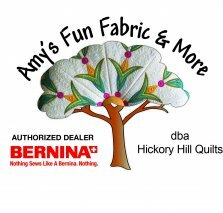 If you purchased your machine from someone other than Hickory Hill Quilts, you are still welcome in our classes. To all Hickory Hill purchases and those moving from out-of-state, the classes are free. If you want to transfer your warranty period to us and take classes here from an in-district store, come in and talk to us about “adopting” your machine, so that we can provide your classes and warranty work for you.